The other day, a company we’ve never worked with before, asked us to deliver a workshop. The request came via email, and a normal response would have been to simply send them a proposal for the requested training. We didn’t do that. Instead, we got on a phone call to understand more about this company’s needs. What did they hope to accomplish via our training? During the call we learned that they were organized into lots of small component teams, those teams didn’t integrate very often or very well and their software development process was incredibly slow. We delicately explained to them that the training they requested wouldn’t likely help them because of how they were organized. They needed something different. We suggested they begin with a cheaper service we provide, since it had a higher chance of helping them begin to make real improvements in their company. I’ll never forget those words. Ever since hearing them, I’ve tried to live by those words, every day, with every customer. Managing your customer’s risks means putting their needs before your own. If you are preoccupied with internal politics, issues on a team or your own personal agenda, it’s unlikely you’ll be good at managing your customer’s risks. 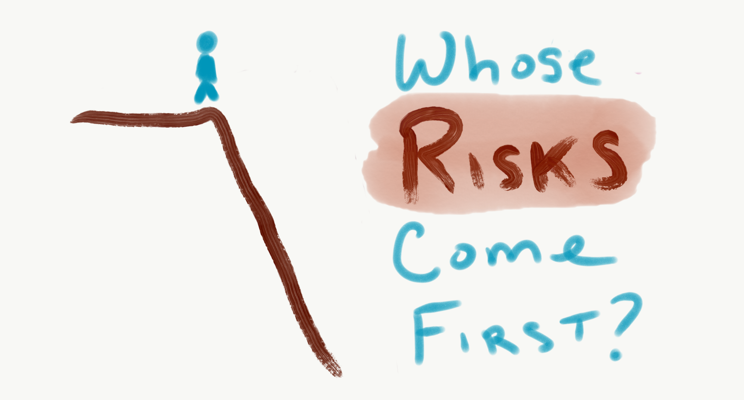 I obsess over my customer’s risks because I know that doing so is better for them and better for my company and colleagues in my company. Managing your customer’s risks is impossible if you don’t understand their needs. What do they hope to achieve and what challenges do they face? What risks are associated with not meeting those needs. What risks is your customer unaware of? Spending time with customers, or perspective customers, is essential to help manage their risks. The customer isn’t always right about what they want or need. Your job is to help them select the best product or service that manages their needs. I’ll never forget an experience I had with Wacom, makers of interactive tablets and pens. I needed a way to draw colored lines on source code (this was long before iPads were invented) and they seemed to have the product I needed. I chose a product from their catalog, a nice big tablet that cost about $1000. I called them to make sure that the product could do what I needed and on that call they asked me what I was planning to do. After hearing my explanation, they suggested a far cheaper product in their catalog. I bought the cheaper product and was delighted with the results. Wacom was managing my risks. I felt protected by them and I felt that they cared about me. The cheaper product I purchased handled my needs just fine. Organizations that obsess over customers are constantly working to manage customer’s risks. I know many people who buy shoes from Zappos because the company makes it super easy and convenient to return shoes that aren’t a good fit. There are dozens of such stories from companies we love. Follow Bob’s advice and manage your customer’s risks. You’ll love the results and your customers will too.